Ever had that feeling that you have seen it all before? That certainly was very much the situation at Lowestoft Bus Station earlier this afternoon where I witnessed a Great Yarmouth theme! It was very much a case of déjà vu! resident at the East Anglia Transport Museum. Due for its mot next week! Today is anything but black, although it does seem to be taking a long time for daylight to arrive on the east coast! 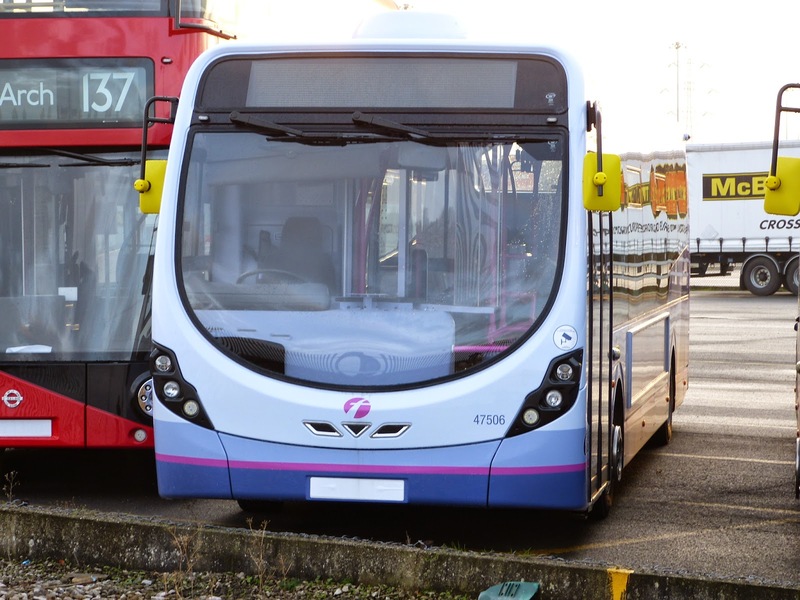 Whilst the majority of the batch moved on to First Eastern Counties, 20108 remained with First Thamesway. 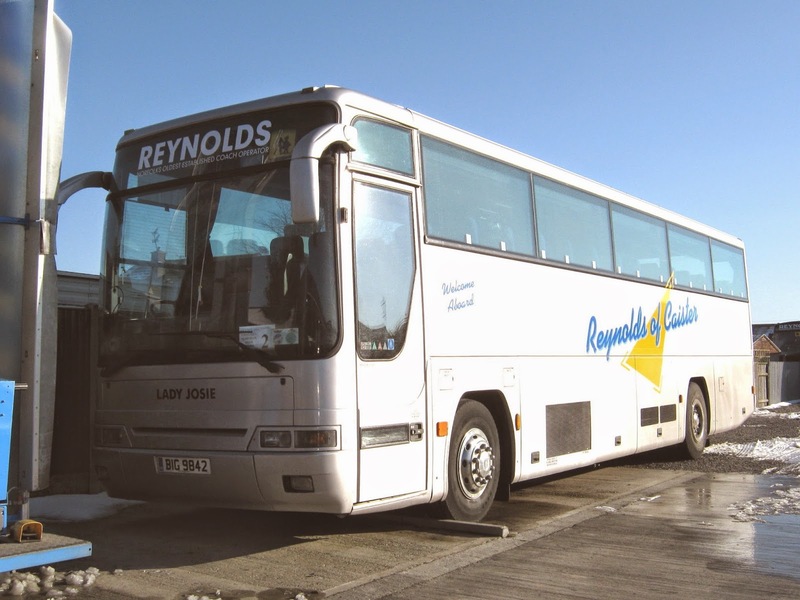 In January 2004 it went on extended loan to First Wyvern for use on school contracts. Reports are coming in this morning that a 'new Anglianbus terminus' has been established in Beccles! My thanks to Tim for the report and photo ......... cue the tumble-weed! 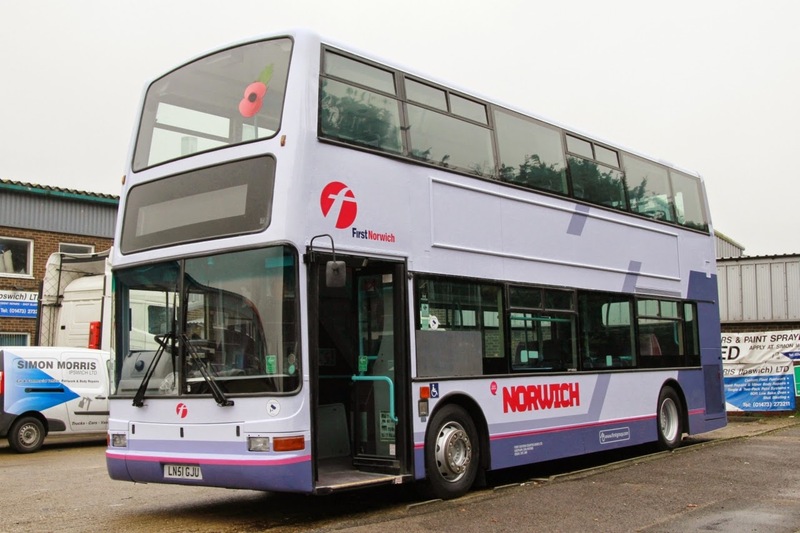 Instead 47504 SN64CPY paid a visit to Norwich to ferry new recruits around the area with First Business Manager Chris Speed in charge of the mystery tour! 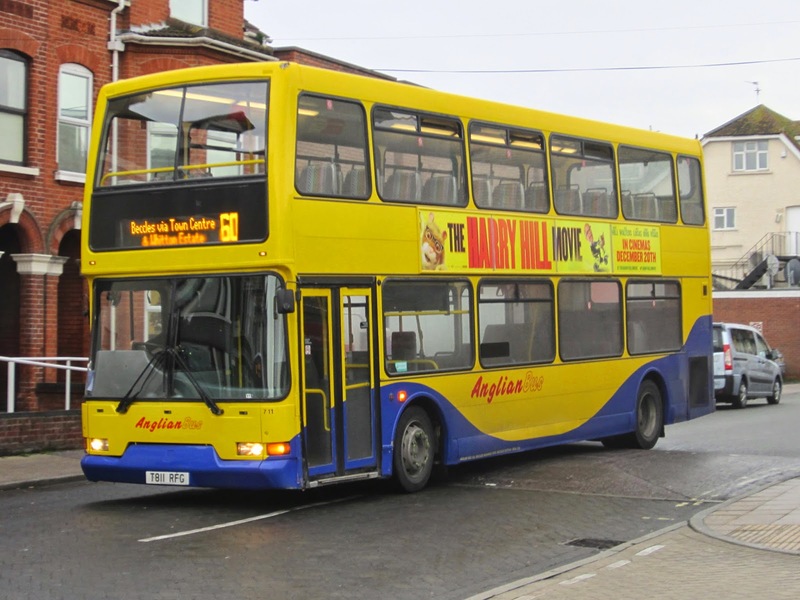 The bus is seen at Norwich's Lansdowne Road Depot and I can't help thinking that the destination is a little bit over the top ! 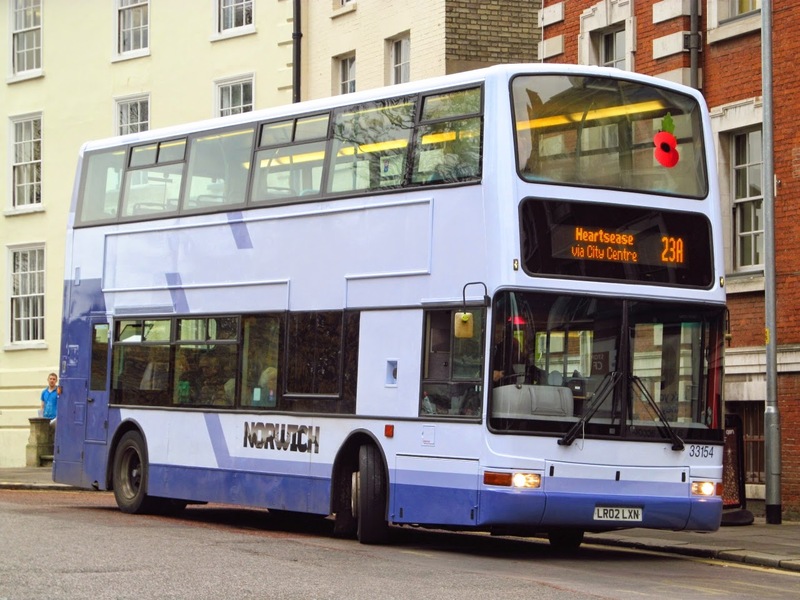 The next Norwich repaint to report is 33060 LN51GJU. Jim Long has been on the ball today and captured her looking a bit different to yesterday's photo. What a difference a day makes! 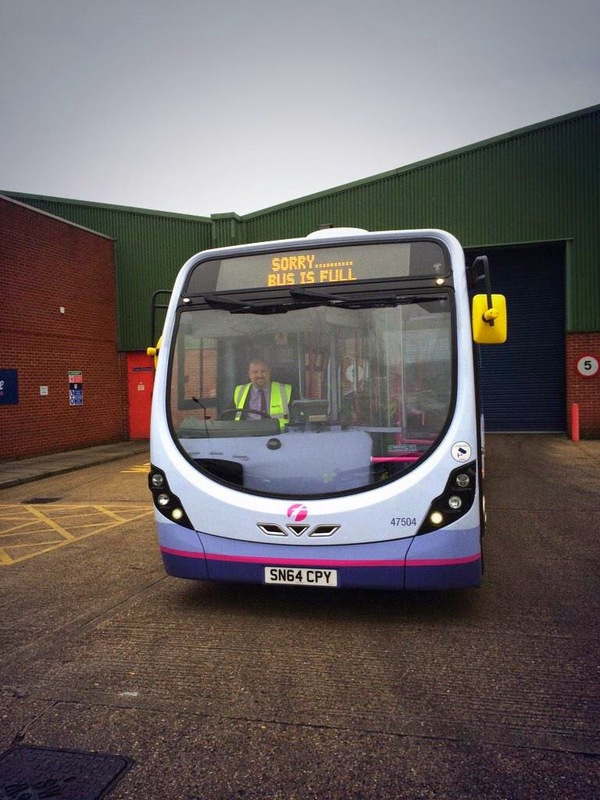 It is now complete with First lettering and Pink relief, note the Red fleetnames! Many Thanks to Jim for use of his photos. 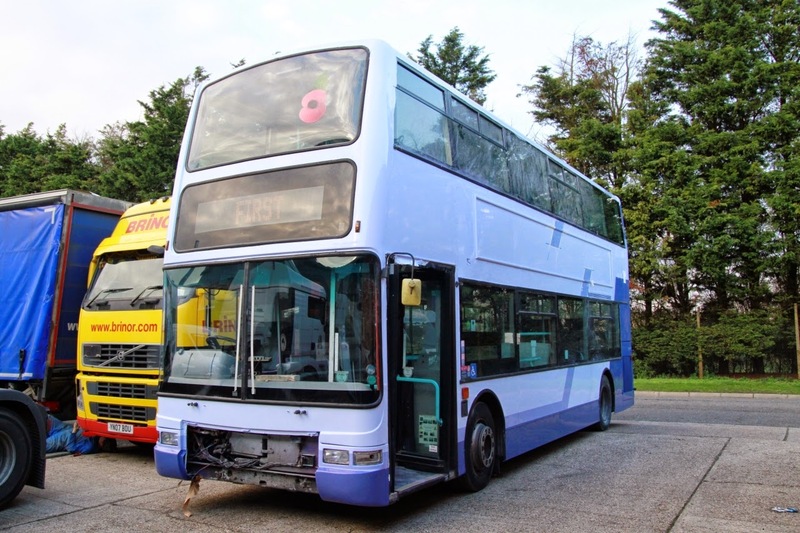 Talking of Lowestoft, their Dennis Dart SLF 43481 R681DPW paid a visit to Caister Road for repairs, only to be returned without any work being carried out - being deemed to be in a poor state of repair! Many of you will wonder what the latest situation is with regards to Olympian 34110. 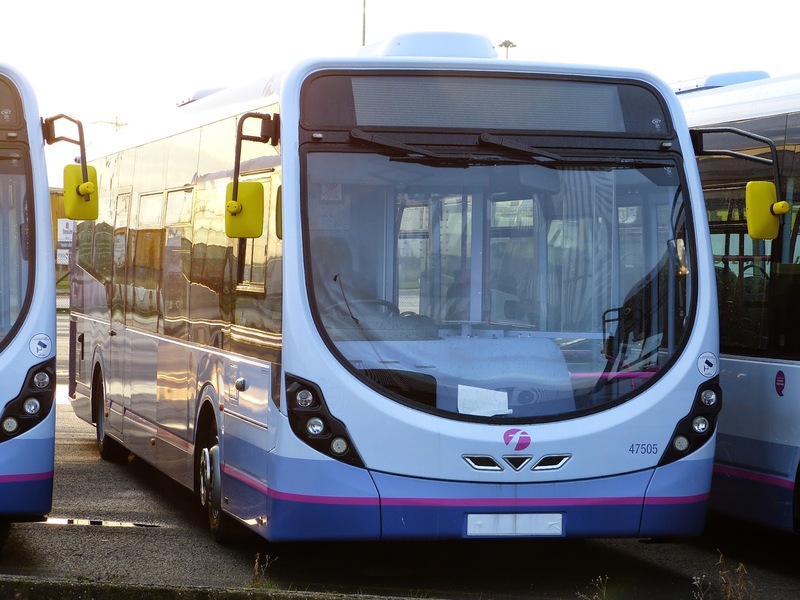 An assessment of its condition and the costs to return it to service means that it is currently uneconomical to repair. If anyone is looking to preserve the last Olympian built a lot of money will need to be spent on it! 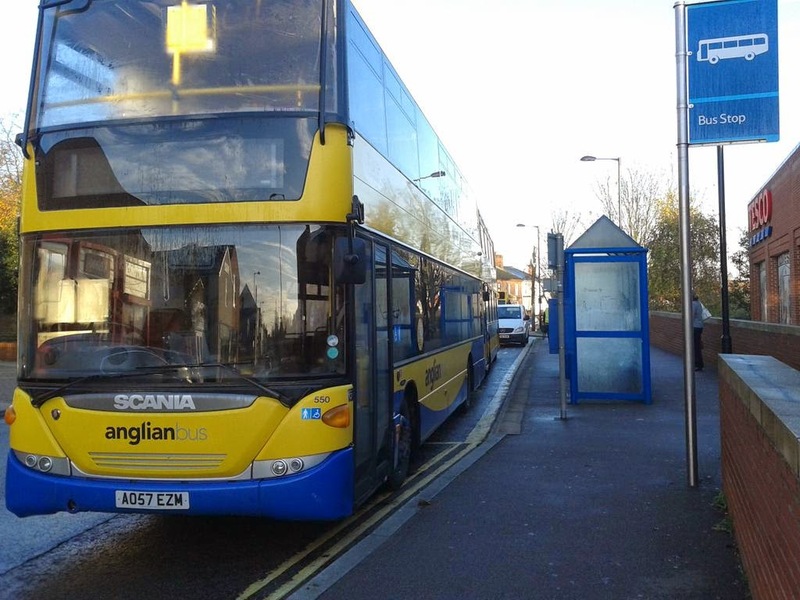 The situation regarding No 711 was obtained in good faith from the Anglianbus website but its location has been disputed by another enthusiast! 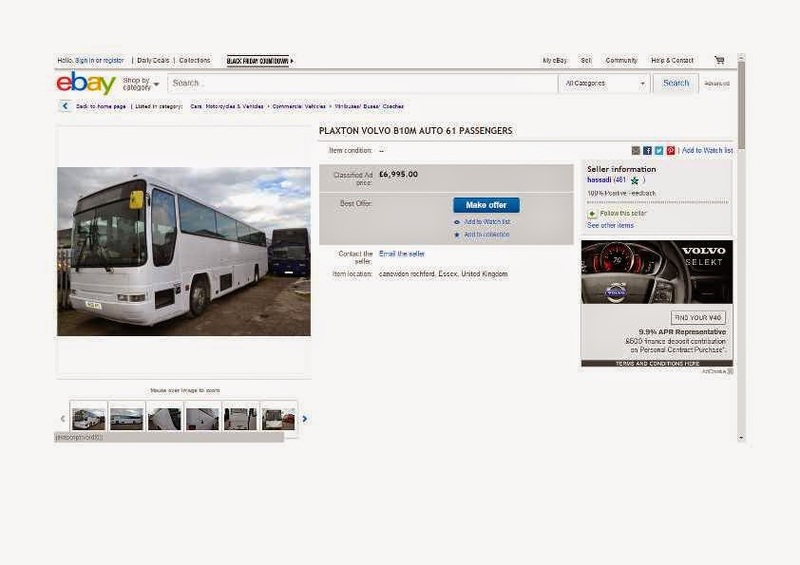 From the outset, East Norfolk Bus Blog (ENBB) has always stated that the quality of information contained on other websites is out of our control and is not our responsibility. Rest assured ENBB always reports the facts and not the fiction! The sale was completed on Friday (November 14th) and a report appeared in yesterday's Hunts Post. 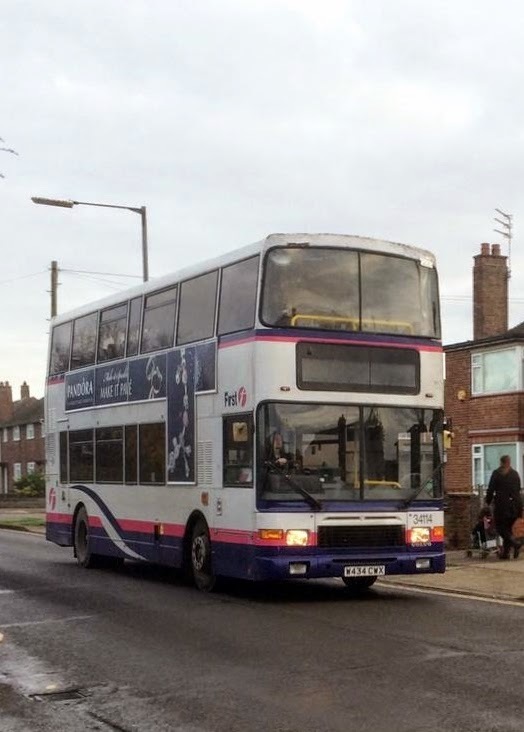 As regular readers of the blog are aware, the company operates a number of seasonal East Anglian Express coastal services to the area - although some continue through to December! 'Speaking to The Hunts Post, Mr Lee, whose grandfather Henry set up the business, said the decision to sell had been a tough. “It’s been going for 95 years and we would have liked to have made it to the 100th year. But the family is getting older and we decided we would not go to a fourth generation so we thought this would be the best move. 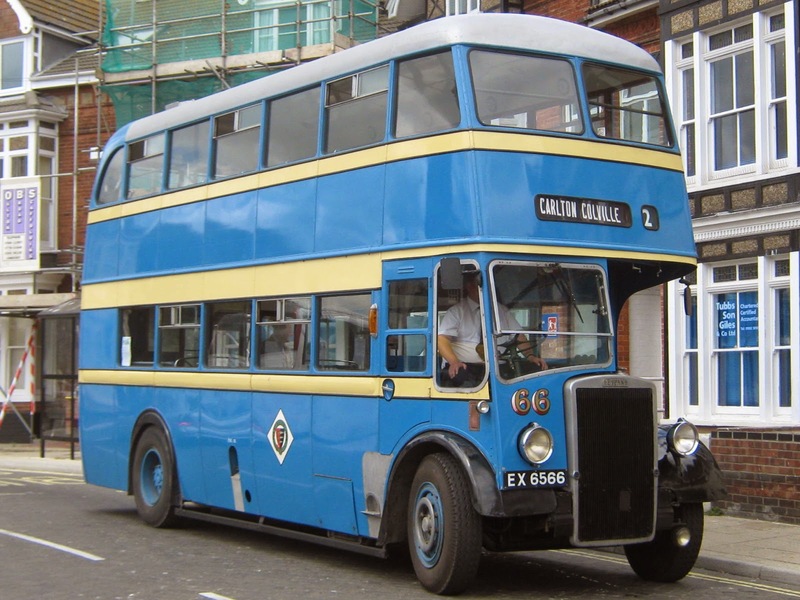 The second arrival was that of First Essex 47527 - sent to Caister Road in error! He visited the docks earlier this afternoon and found the remaining four eventually bound for Caister Road had travelled over from Northern Ireland. My thanks to Malcolm for going out of his way to get these photos and I trust you enjoyed your shopping in Kendal! 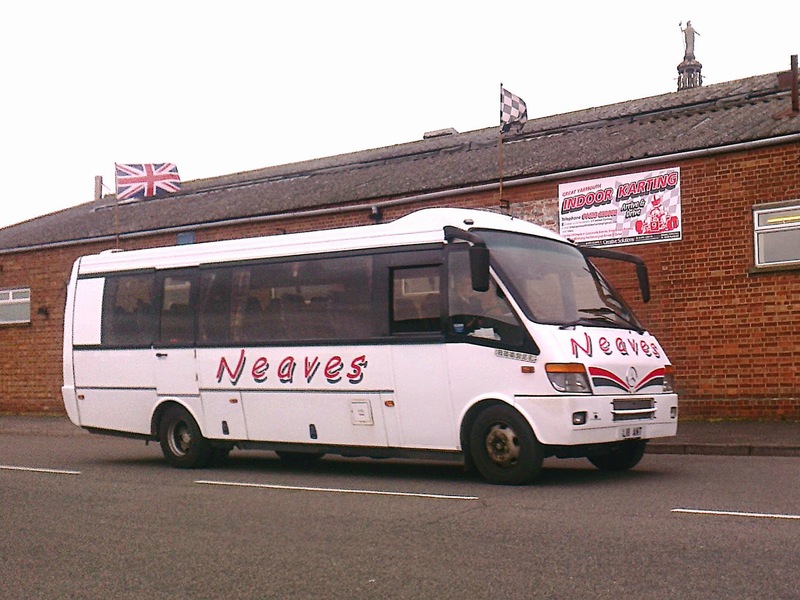 David Waters has kindly passed on photos from Wednesday last week whilst he was in Beccles. 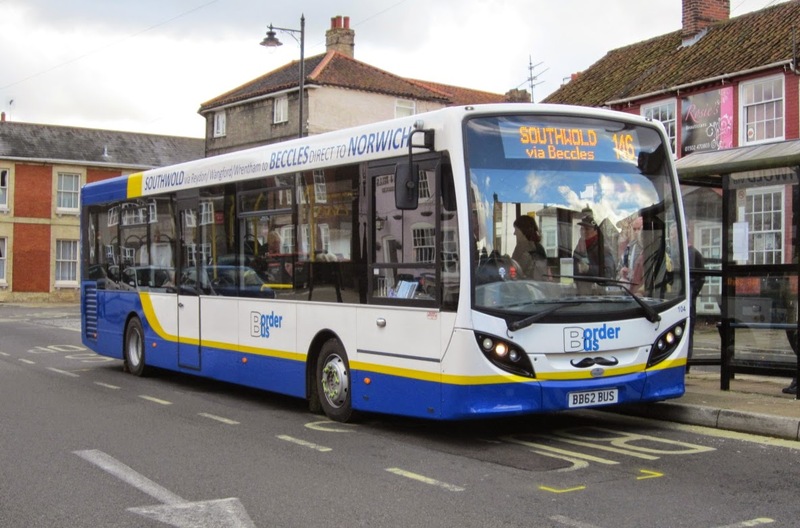 Borderbus recently aquired Enviro 300 KX54NKH and its seen here working the 146 to Norwich. 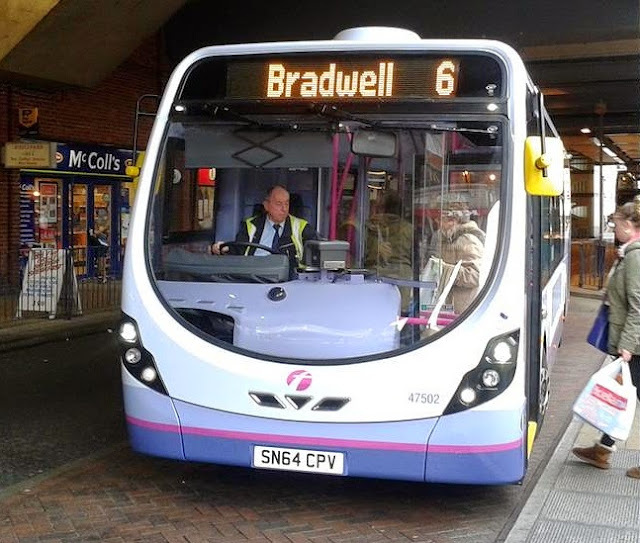 Also seen in the Bus Station is BB62BUS a smaller Enviro 200. Note both are wearing moustache logos to promote the Movember Charity. A Brief trip up to Norwich this morning to attempt to photograph all the recent repaints and loans, my work was done in less than an hour in Castle Meadow with all the required vehicles appearing in double quick time. 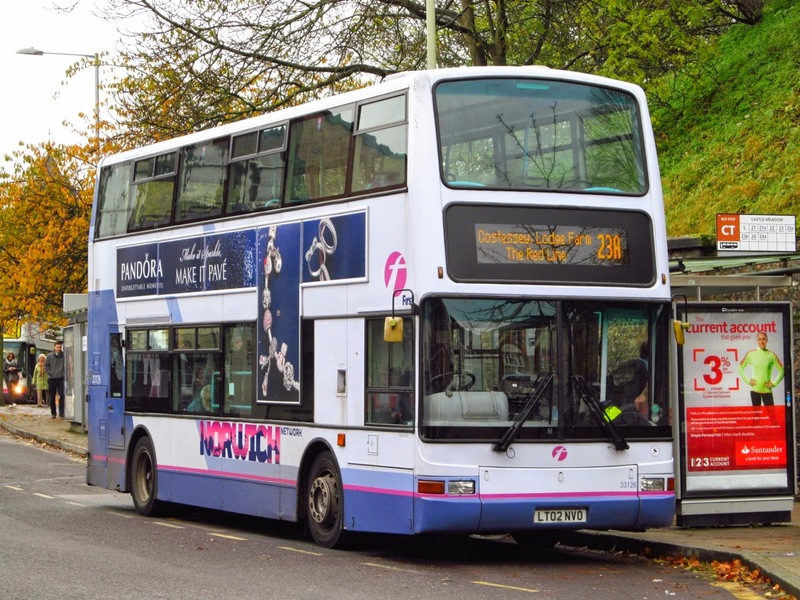 First up is 33126 LT02NVO which is on long term loan from First South Yorkshire, seen working the 23A service. 33154 LR02LXN was repainted at Simon Morris in Ipswich and has returned sporting unusual Black fleetnames and no pink relief has been applied. 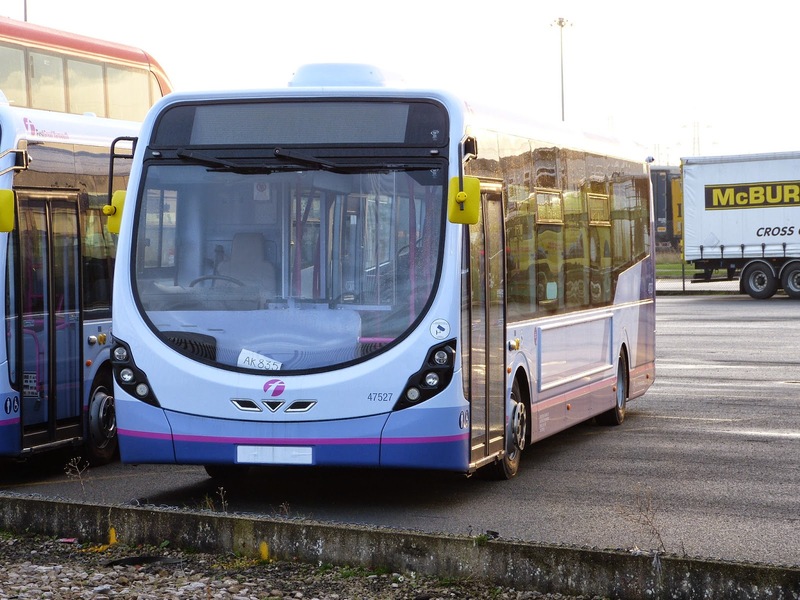 Last on the list to photograph was 33166 LR02LYD which has returned from Rotherham in its new Purple line guise, lacking any lettering at present which it needs to make the livery complete. 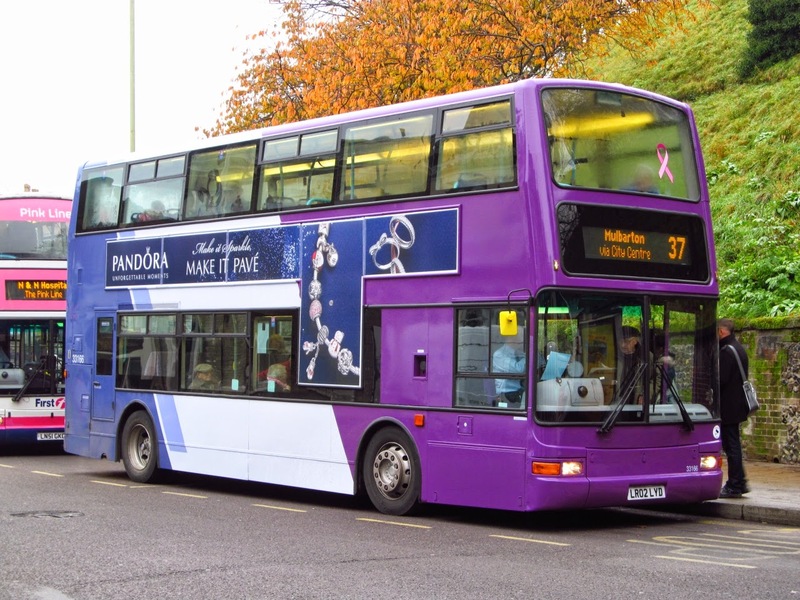 33163 was also noted in use to complete the repaints out and about today in the city. Currently away at Rotherham is 33003 whilst 33060 is at Simon Morris in Ipswich being treated. I ventured back to Yarmouth to seek out the Streetlites and both were out and about, 47502 was photographed at Caister Road between duties. 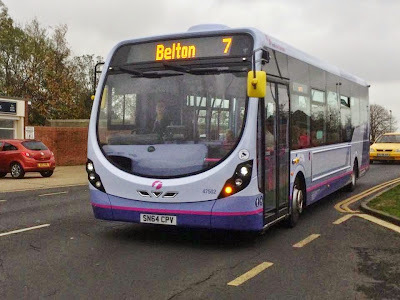 As suggested in an earlier post they were most likely to appear on First's 5, 6 or 7 routes. 33154 is not far off being completed now, Jim Long managed to catch a shot of her after gaining the main part of the new livery, just the pink lines and vinyls to be added. 33003 has left Norwich and headed north to Rotherham for repaint into Purple line colours to join 33163 & 33166 which have already returned to the city. 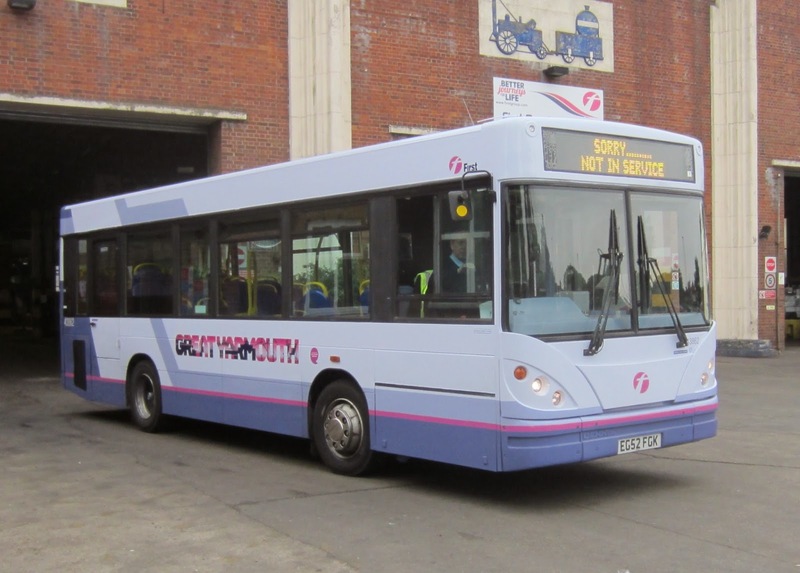 Great Yarmouth based operator Ambassador Travel was employing Volvo B9R/ Caetano Levante 210 BF63ZSK on the National Express 491 service from the capital to Great Yarmouth and Lowestoft. This is the third weekend of diverts at Gorleston's Magdalen Estate - although it's only the second time work has been carried out! 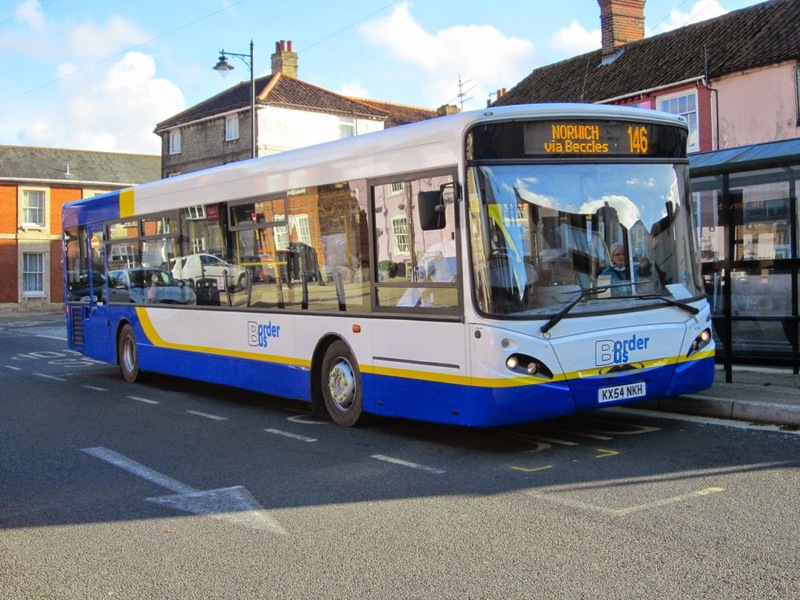 During this period, the X1 operated between Gorleston High Street and James Paget Hospital via Church Lane, Middleton Road and Lowestoft Road with all stops on Middleton Road being served. Service 2 operated as normal as far as Selwyn Road and then continued along the whole length of Trinity Avenue before continuing right onto Magdalen Way to terminate at the bus stop on Magdalen Square. On the return journey it operated via Hertford Way, right into St Anne's Crescent, then as normal. Lowestoft Road and Bridge Road whilst others operated via Trinity Avenue and terminated at the lay-by on Hertford Way. 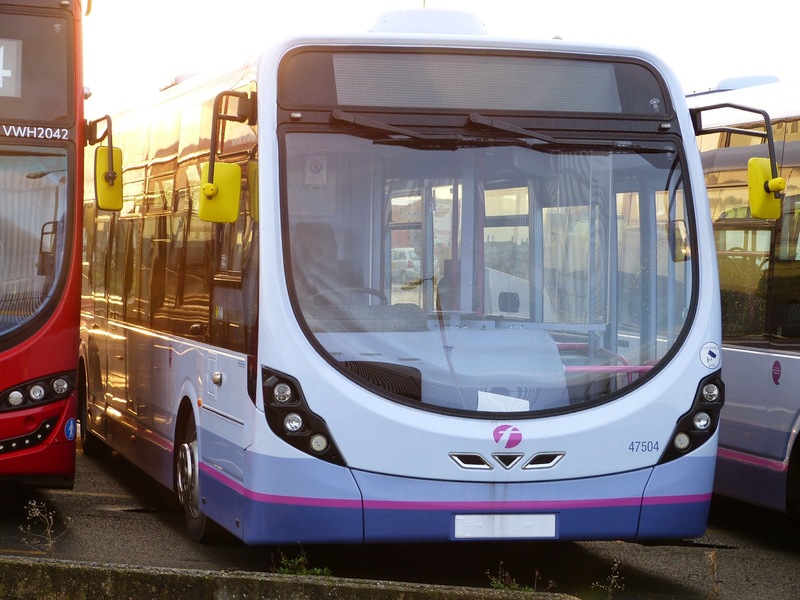 An additional shuttle service ran every half hour between Hertford Way and Gorleston High Street to allow passengers to transfer to other services.